Huge Savings Item! 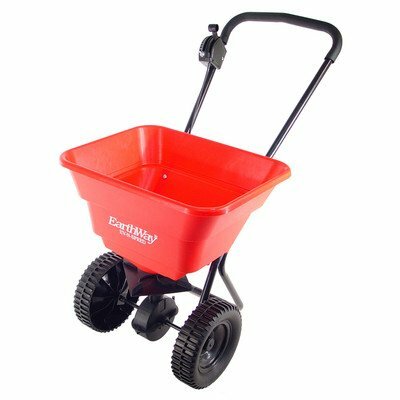 Save 14% on the Assembled Spreader by Earthway at The Net Stores Network. MPN: EAR2050SU. Hurry! Limited time offer. Offer valid only while supplies last. EAR2050SU Features: -Material: Plastic. -Rust proof hopper. -Commercial quality gearbox. -80 pound hopper capacity. -Easy rolling over any lawn. EAR2050SU Features: -Material: Plastic. -Rust proof hopper. -Commercial quality gearbox. -80 pound hopper capacity. -Easy rolling over any lawn. Color: -Red and Black. Material: -Plastic. Country of Manufacture: -United States. Dimensions: -Assembled Spreader with Large Hopper and Wheels. Overall Product Weight: -50.69 lbs. If you have any questions about this product by Earthway, contact us by completing and submitting the form below. If you are looking for a specif part number, please include it with your message.